Two families in Bloomingdale, Illinois are at odds over Joey, an 8-year-old Himalayan cat. Joey, owned by Nichole Milone, went missing in 2013. 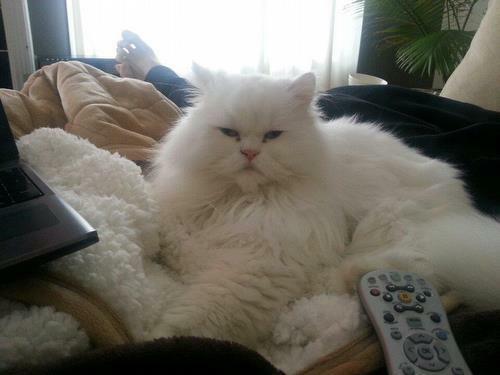 Two families in Bloomingdale, Illinois are at odds over Joey, an 8-year-old Himalayan cat. Joey, owned by Nichole Milone, went missing in 2013. He was microchipped and Milone listed him as missing on Pet Key, a microchip location website. But in April of this year, Milone discovered that Joey is alive and well. In fact, he has been living on the same street, just three houses away this entire time. Shawnie and Steve Godke have been living with and caring for Joey all this time. According to Shawnie, Joey had been coming to their house for months and months. They’d been feeding him, but telling him to go home. Shawnie states that Joey looked neglected, and they finally let Joey into the house after they had him scanned for a microchip and were unable to find his owners. Apparently the Godke’s vet checked Joey’s microchip number in the RFID-USA Microchip Registry, but didn’t check the American Animal Hospital Association, where Joey was registered. Milone happened to see Joey in the Godke’s garden one day and had his microchip scanned, confirming he was her cat. However, the Godkes don’t want to give Joey up, since they now see him as a member of their family. Both families have hired lawyers and both want custody of Joey. It’s a tough situation, and it seems that no matter what solution is arrived upon, one of these families will be missing a beloved cat. That’s why we always tell people to ask the neighbors if they’ve seen their missing cat and put up posters all over the neighborhood.